When sixteen-year-old Johanna accepts a ride home from a meeting with Paul, even she is surprised when she boldly asks him to kiss her. Paul is sort of a well-known figure at their high school, not because he’s an athlete or a particularly good student, but because he is funny and good-looking. People want to be around him. Johanna, on the other hand, is studious and not very popular. Her one and only friend, Pam, calls her “Books” and the two girls have a standing date at the local bookstore on Saturday. 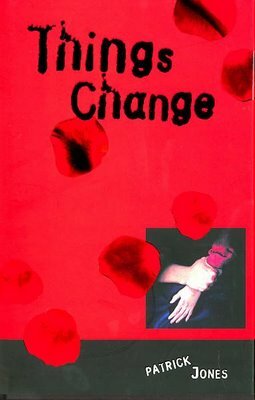 Patrick Jones’ debut novel Things Change will appeal to fans of realistic fiction. Johanna will be immediately recognizable to young girls; they will either see themselves or someone they know in her. Like many teenage girls, Johanna tries to please her parents, tries to balance school and life and falls head over heels in love with a boy who is fighting his own demons. Because one thing Things Change is not is a straight up love story. Paul and Johanna eventually hook up and it’s all sunshine and roses – except for when it’s not. Paul is possessive and jealous and has a temper that causes him to lash out at Johanna, inflicting physical and emotional pain for which he is almost immediately contrite. But that’s the pattern, right? And Johanna – young and inexperienced – does what many much older women in her situation might do: she makes excuses, tries to be perfect, forgives. Although the third person narration is mostly limited to Johanna’s point of view, Jones does something smart, giving the reader a glimpse of Paul’s psyche by letting us read letters he writes to his dead father. I say it’s smart because it prevents Paul from being a one dimensional monster and the book from being a one-note cautionary tale. Paul’s demons in no way excuse his deplorable behaviour, but it does make him human and somewhat sympathetic. Patrick Jones used to be a Young Adult librarian and Things Change certainly demonstrates that he’s listened to and observed teens carefully. This book doesn’t preach nor talk down to his target audience. It’s not overly graphic, but there is some sexual content and bad language. That said, I will happily be recommending it to readers in my classroom – both those students who claim they don’t like to read and those who want to read compelling and realistic fiction. This entry was posted in Uncategorized and tagged 2012, Book Review, mature teen, teen, YA by Christie. Bookmark the permalink.